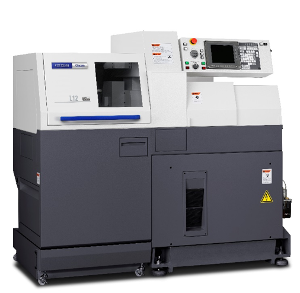 Citizen Machinery has further developed the programmable application control of chip size through its world-leading Low Frequency Vibration (LFV) cutting technology by applying it to the 12 mm capacity Cincom version of the popular L-Series. The 5-axis Cincom L12-IILFV incorporates high spindle speeds of 15,000 revs/min, to maximise performance on smaller diameter work in a compact machine requiring just 1,760 mm by 820 mm floor space. Available through Citizen Machinery UK, the Cincom L12-VIILFV can also be specified with a 16 mm capacity bar size option to extend the capability and maximise productivity from the in-built rigidity of the design to accommodate LFV technology. These include special build standards, slideways, bearings and ballscrews plus control and software. LFV cutting technology enables precise programmable control of chip size while eliminating deflection on very small dimeters when turning. LFV can also be selectively applied to drilling, grooving or even thread cutting plus providing an important aid to machining difficult materials from plastics and copper to high alloy steels. 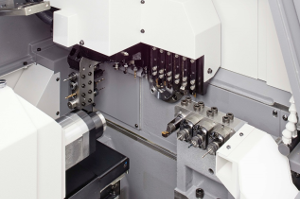 Through the high speed Cincom control, the servo axes in X- and Z- can be selected to provide independent rapid oscillation of the cutting tool, creating in effect, air gaps in synchronisation with the rotation of the spindle. The machine features a 3.7 kW 15,000 revs/min main and 0.75 kW 10,000 revs/min sub-spindle, a removable guidebush assembly for economic bar usage on shorter components, with a guidebush stroke per chucking of 135 mm. Rapid traverse rates are fast at 35 m/min to minimise non-cutting positioning times. Up to 27 tools can be carried on the machine X1-Y1 gang toolpost comprising six as gang turning tools, between four and nine gang-driven tools powered by 0.75 kW 10,000 revs/min motors and four front and four back gang drilling tools. The back X2-Z2 toolpost holds a further four driven tools powered by 0.5 kW 9,000 revs/min motor. Deep hole drilling can also be accommodated on the opposite toolpost. Citizen also provides tooling options on the gang toolpost of three double ended spindles for end face drilling with a 30 deg swing adjustment, an outer diameter milling spindle and a vertical four position tool holder. The back toolpost can also carry an option of an outer diameter milling spindle and a slitting spindle with 30 mm diameter cutter capacity. Access to the working area is aided through a wide, lift-up cover. Work pieces from the sub-spindle are unloaded into a chute with conveyor to prevent damage and up to 100 litres of coolant is held in an easily removable tank.